Photo caption: Curtis Moody, teaches school children about planting and growing at Moody Street Garden. Photo courtesy of Cedric Owens. Evidence of urban agriculture’s rise in Virginia can be seen in counties like Arlington and Fairfax, which have already established legislation and zoning codes to address urban agriculture. Some communities like Alexandria, Fairfax and Arlington have long waiting lists for community garden spaces. Courses and training programs like Virginia State University’s 12-week Sustainable Urban Agriculture Certificate Program are growing in popularity. And the number of urban farms in Richmond, Hampton Roads and other urban areas across the commonwealth has exploded over recent years. As more farmers get started on vacant lots and rooftops and in shipping containers and other non-traditional urban spaces, conversations about research, policy, safety, land-usage rights and sustainability are on the rise. To address these and other issues pertaining to the growth of Virginia’s urban agriculture industry, the Virginia Cooperative Extension program at Virginia State University, among other partners, is hosting the 4th Virginia Urban Agriculture Summit April 23–25, 2019, at the Founders Inn and Spa, 5641 Indian River Rd, Virginia Beach, Va. Over three days more than 100 urban farmers, gardeners, foodies, ag-tivists, policy makers and government leaders will convene to network and learn about one of agriculture’s fastest growing sectors. Keynote speakers include Dr. Jewel Bronaugh, Virginia’s 16th Commissioner of Agriculture; Duron Chavis, manager of Community Engagement at Lewis Ginter Botanical Garden in Richmond; Shelley Blades, farm manager and executive director of Lynchburg Grows; and Curtis Moody, community garden coordinator of Moody Street Garden of Newport News. Topics covered at the summit will include urban food systems, food deserts, food security, food safety, postharvest handling, food justice, urban environmental issues and urban economic development. Interested parties are encouraged to submit an abstract for an oral, poster or panel presentation for the summit. Visithttps://www.ext.vsu.edu/vuas-abstracts before March 15. Summit registration is $150 and is limited to 150 registrants. The registration cost includes two continental breakfasts, two buffet lunches, a networking dinner reception, and continuous food and drink refreshments throughout much of the summit. An award-winning chef will prepare food sourced from the freshest meats, seafood, as well as seasonal fruits and vegetables from local and regional artisan providers. To register, visit www.ext.vsu.edu/calendar, click on the event and then click on the registration link. Accommodation is available for $99/night per room until midnight March 24. Visithttps://www.ext.vsu.edu/vuas-conference-venue to book your accommodation or call the hotel at 1-844-382-7378. Registrants calling directly to book a room must ask for the “2019 Virginia Urban Agriculture Summit” room rate. Watch an overview video from the 3rd Virginia Urban Agriculture Summit athttps://www.youtube.com/watch?v=97_O0vUUKPw. Learn more about the first three summits at https://www.ext.vsu.edu/vuas-past-events. For further information or if a person with a disability desires any assistive devices, services or other accommodations to participate in this activity, contact Mollie Klein at mklein@vsu.edu or call (804) 524-5964 / (800) 828-1120 (TDD) during business hours of 8 a.m. and 5 p.m. to discuss accommodations no later than five days prior to the event. Cut flowers—the kind you can pick up at the grocery store or are found on many restaurant tables—is part of the “green industry,” the fastest growing sector in U.S. agriculture and the second most important in terms of economic impact, according to the USDA. “People don’t often think of farmers growing flowers, but the cut flower industry is significant in Virginia,and is often an excellent source of income for farmers with small acreage,” said Susan Cheek, Virginia State University (VSU) Small Farm Outreach Program (SFOP) agriculture management agent. To meet the demand for knowledge and training in this growing industry, the SFOP, part of the Virginia Cooperative Extension program at VSU, is hosting its second cut flow growers conference in as many years. The conference is one of close to 200 programs the Cooperative Extension program offers through VSU to assist small, limited-resource, socially disadvantaged and military veteran farmers and ranchers across Va. to own, maintain and operate farms and ranches independently. “We are excited to host this conference again in 2019. Our 2018 conference reached capacity quickly, and we know that small farmers in Virginia and across the U.S. are extremely interested in learning how to incorporate locally grown flowers and herbs into their farm operations,” said SFOP Director William Crutchfield. Per acre, flowers are one of the most profitable crops to grow, and they are especially suited to small farm operations. A 2014 University of Wyoming Extension publication indicated specialty cut flowers achieved gross yields as high as $25,000 or $30,000 per acre. At the 2019 Cut Flower Growers Conference, attendees will learn more about the positive results they can get from starting a cut-flower growing operation or adding cut flowers to their current farm products—not only for their profit margin, but for the benefit of human health, insect and wildlife habitat, and the environment. The two-day conference will bring together new and experienced growers, buyers and representatives from government agencies to help attendees learn how to improve the production and marketability of a cut flower farm business. Local and national growers will explain how to build relationships with wholesale and retail buyers; provide tips for growing and marketing pollinator-beneficial plants and flowers; and share insights about establishing a high tunnel operation to extend the growing season. Participants will also learn how to add value and profit with herbs and medicinals, and see hands-on demonstrations for floral design with native wildflowers and herbs. In the opening keynote, Brent Heath, owner of Brent and Becky’s Bulbs in Gloucester, Va., will discuss best bulbs for cut flowers selected for longevity of blooms, ease of harvest and added value of fragrance. In the closing keynote, Dave Dowling will share his experiences and insights from 20 years of cut flower farming and five years as a sales rep and advisor to cut flower farmers. Dowling is employed by New Jersey-based Fred C. Gloeckner & Company, Inc., a horticulture wholesale distributor. Registration is $150 per person, with a 10 percent discount for groups of three or more. To register, visit www.ext.vsu.edu/calendar, click on the event and then click on the registration link. Persons needing further information or have a disability and desire any assistive devices, services or other accommodations to participate in this activity, can contact the VSU Small Farm Outreach Program office at smallfarm@vsu.edu or call (804) 524-3292 / (800) 828-1120 (TDD) during business hours of 8 a.m. and 5 p.m. to discuss accommodations no later than five days prior to the event. The SFOP provides outreach and assistance activities in production management, financial management, marketing, available USDA farm programs and other areas to increase farm profitability and promote sustainability. It has recently added an additional 10 counties, bringing the total it serves to 74. It has also hired additional agriculture management agents and offers public events across the state. For more information, visit https://www.ext.vsu.edu/small-farm-outreach-program/. Virginia State University (VSU) will receive $200,000 in grant funding from the U.S. Department of Agriculture (USDA) to help socially disadvantaged and veteran farmers and ranchers (SDVFR) in the state. The funding is part of $9.4 million in grants announced on October 12 by Secretary of Agriculture Sonny Perdue. The Small Farm Outreach Program (SFOP), which is part of Cooperative Extension at VSU, supports SDVFR by equipping them with the tools and skills needed to make informed decisions in owning and operating profitable farm businesses. “We’re grateful for the funding support from USDA. We will use the funding to continue our training and outreach efforts to help socially disadvantaged and veteran farmers and ranchers build successful and sustainable businesses,” said SFOP Director William Crutchfield. The grant money will be used to support an array of the SFOP’s programming such as workshops, conferences, field days and farm tours, as well as the one-on-one training that the SFOP provides to SDVFR located in areas from the Northern Neck to the South West region of Virginia where there is a high concentration of SDVFR. The grant will enable them to provide support to an additional 10 counties in southwest Virginia bringing the total to 74. Funds will also be used toward a new high tunnel project that will be completed in early spring 2019 and two mobile demonstration units. Both projects also support training and education of SDVFR. Yet another important SFOP initiative is to create awareness and increase participation by SDVFR in USDA farm programs. VSU’s Small Farm Outreach Program aims to encourage and assist limited-resource, socially disadvantaged and military veteran farmers and ranchers to own, maintain and operate farms and ranches independently, to participate in agricultural programs and improve their overall farm management skills. The SFOP provides outreach and assistance activities in production management, financial management, marketing, available USDA farm programs and other areas to increase farm profitability and promote sustainability. The program provides educational programming in approximately 74 Virginia counties, which have the highest concentrations of limited-resource, socially disadvantaged and veteran farmers in the state. For more information, visit https://www.ext.vsu.edu/small-farm-outreach-program/. The Virginia State University Small Farm Outreach Program (SFOP) will host the educational workshop, Pastured Raised Commercial Rabbit Production, on Thursday, November 15 from 1:00 p.m. to 4:00 p.m. at VSU Randolph Farm Pavilion, 4415 River Road, Petersburg, Va.
Attendees will get practical information about Virginia laws for processing and selling rabbit meat. They will learn about barn, cage and processing unit construction, and enhance their knowledge about which rabbit species are best suited for meat. Participants also will learn how rabbit production can become part of a nutrient management plan to efficiently manage waste as a cost-effective, organic soil amendment in the garden and on the farm. Rabbits convert feed to meat more efficiently than cattle, and have been called the next big thing in pastured livestock. They may be raised for commercial purposes, including meat consumption, as pets and for laboratory use. According to the 2012 U.S. Department of Agriculture National Agricultural Statistics Service (NASS), there were 13,420 farms with rabbits with an inventory of 400,049 and 852,837 rabbits sold. This educational workshop is free and open to the public. Space is limited, so register early. To register, visit www.ext.vsu.edu/calendar, click on the event and then click on the registration link. If you need further information or are a person with a disability and desire any assistive devices, services or other accommodations to participate in this activity, please contact the Small Farm Outreach Program office by email at smallfarm@vsu.edu or call (804) 524-3292 / TDD (800) 828-1120 (TDD) during business hours of 8 a.m. and 5 p.m. to discuss accommodations no later than five days prior to the event. The Small Farm Outreach Program, which is part of Cooperative Extension at Virginia State University, aims to encourage and assist limited-resource, socially disadvantaged and military veteran farmers and ranchers to own, maintain and operate farms and ranches independently, to participate in agricultural programs and improve their overall farm management skills. The SFOP provides outreach and assistance activities in production management, financial management, marketing, available USDA farm programs and other areas to increase farm profitability and promote sustainability. Currently, the program provides educational programming in approximately 64 Virginia counties, which have the highest concentrations of limited-resource, socially disadvantaged and veteran farmers in the state. For more information, visithttps://www.ext.vsu.edu/small-farm-outreach-program/. Virginia State University (VSU) is pleased to announce the addition of three new personnel who have joined Cooperative Extension and the College of Agriculture. Chantel Wilson, Ph.D., has joined as 4-H STEAM Extension specialist, Jerry Bettis Sr., Ph.D., has joined as forestry Extension specialist, and Ronald Howell has rejoined the College of Agriculture as director of Operations Management reporting to Dean M. Ray McKinnie. Dr. Wilson is also a Virginia certified turf and landscape nutrient management planner. Before joining VSU, she served as urban nutrient management Specialist at Virginia Tech contracted to the Virginia Dept. of Conservation and Recreation, and as a graduate research assistant/teaching scholar at Virginia Tech. Dr. Wilson joins VSU’s 4-H Extension specialist Dr. Maurice Smith, who specializes in youth development, citizenship and leadership development. Dr. Bettis holds a Ph.D. in forestry from North Carolina State University. Before joining VSU, he served as forestry-natural resources Specialist at Tuskegee University, and as early rotation forester and raw materials representative at the Weyerhaeuser Company in New Bern, NC, where he was responsible for fire, vegetation and pest control on approximately 500,000 acres of timberland. Howell, who earned his master’s degree in agriculture and Extension education-community development from Virginia Tech, will be integral to the administration of budgets, developing management procedures and implementing new business processes. He will also provide administrative leadership to Randolph Farm and have oversight for the 1890 Facilities Grant Program. And through a partnership agreement, he will serve as a special advisor to the Office of the Secretariat of Agriculture and Forestry to increase land-grant capacity for outreach, student development and build strategic partnerships and initiatives that improve the stability and sustainability of farm and forestland owners in Virginia. Howell has held several positions with USDA and with the Commonwealth of Virginia, each time at a greater level of responsibility. Goat and sheep health is the theme of this year’s Small Ruminant Field Day, which will be held on Friday, September 21, from 9:00 a.m. to 3:00 p.m. at Virginia State University’s Randolph Farm, 4415 River Road, Ettrick. Dr. Niki Whitley, an animal science Extension specialist at Fort Valley State University in Georgia, is this year’s keynote speaker. Dr. Whitley has worked with goats and sheep for 20 years at the University of Missouri, the University of Maryland Eastern Shore and North Carolina A&T State University. She earned herPh.D. in animal physiology from Mississippi State University. VSU agricultural researchers will also present during the field day. Dr. Michelle Corley will discuss using stinging nettle for deworming and Dr. Eunice Ndegwa will discuss maintaining gut health in pre-weaned kids and lambs. Dr. O’Brien and Amanda Miller, VSU’s herd manager, will conduct hands-on sessions on vaccinations, proper drenching techniques, FAMACHA scoring, body condition scoring and maintaining hoof health. Goat and lamb products will be available for sampling. Registration is $10 per person and includes lunch. To register, visit www.ext.vsu.edu/calendar, click on the event and then click on the registration link. If you need further information or are a person with a disability and desire any assistive devices, services or other accommodations to participate in this activity, please contact Mollie Klein at mklein@vsu.edu or call (804) 524-6960 / (800) 828-1120 (TDD) during business hours of 8 a.m. and 5 p.m. to discuss accommodations no later than five days prior to the event. On Wednesday, August 22, farmers and buyers will have an opportunity to “meet up” at Virginia State University’s (VSU) Randolph Farm Pavilion, 4415 River Rd., Petersburg, Virginia. The event will take place begin at 9:00 a.m. and end at 3:00 p.m. Farmers and buyers can participate in a networking session that can lead to sales relationships and open doors for follow-up. No contracts will be signed onsite. There will be a roundtable discussion in which some of the state’s top buyers will share what they’re looking for and answer questions. Representatives from United States Development Agency Rural Development will make a presentation, and there will be a Harmonized GAP Introduction workshop. Farmers should come prepared with business cards, and a list of products and/or a price sheet. Buyers—including wholesalers, chefs, restaurant owners, grocers and food service directors—should bring business cards and a list of products they wish to source locally. The event is free and open to the public. Lunch will be provided. Space is limited, so register early. To register, visit www.ext.vsu.edu/calendar, click on the event and then click on the registration link. If you need further information or are a person with a disability and desire any assistive devices, services or other accommodations to participate in this activity, please contact Michael Carter Jr. at (804) 633-9964 or micarter@vsu.edu, or call the Small Farm Outreach Program office at (804) 524-3292 / (800) 828-1120 (TDD) during business hours of 8 a.m. and 5 p.m. to discuss accommodations no later than five days prior to the event. The Small Farm Outreach Program (SFOP) at Virginia State University is holding two Introduction to Quickbooks sessions. The first will be held on Thursday, July 29 from 9:00 a.m. to 12:00 p.m. and the second will be held on Thursday, July 12 from 9:00 a.m. to 12:00 p.m. Both sessions will be held at Virginia State University’s Singleton Hall, Room 304. June has been officially recognized as Virginia Berry Month. On June 7, a formal proclamation issued by Governor Ralph Northam was read aloud by Bettina Ring, Virginia secretary of agriculture and forestry, at the USDA Field Day held at Virginia State University’s (VSU) Randolph Farm. Hundreds of berry farms across the state grow strawberries, raspberries, blueberries and blackberries. More than 6 million pounds of berries are produced each year, which have an estimated value of $8 million in farm income. Colonial Heights, VA, June 07, 2018— As an extension of its Plants with a Purpose program, Sabra Dipping Company, LLC (Sabra) will partner with Virginia State University (VSU) to assist in the development of an educational urban garden at Summerseat. The Summerseat Urban Garden Project will transform a 2.2-acre historic land parcel into a food and agricultural hub designed to address food security issues within local schools and communities, enhance nutrition and food education, and bring people together. Sabra’s Plants with a Purpose initiative was launched as a pilot in late 2016 to address the needs of communities living in food deserts. Richmond, VA has been called the largest “food desert” in America. In addition to the Summerseat collaboration, Sabra is providing tuition assistance for students of VSU’s Urban Agriculture Certification Course, which aims to increase competence and marketability for a career in urban agriculture. Students will have an opportunity to apply their skills in Sabra’s 340 square foot employee workshare garden installed on the Sabra campus in Colonial Heights. Last year VSU received from former Gov. Terry McAuliffe the inaugural Outstanding State Stewardship Award for its preservation of Summerseat, an historic house built around 1860 near present-day VSU. A one-room house with modest Italianate detailing and a raised brick basement, Summerseat is among the last remaining dwellings of Ettrick, a small African-American community established along the Appomattox River in the mid-19th century. Its name is derived from local lore, which says that the structure previously served as a county judge’s courtroom during the summer months. Both Summerseat and Ettrick are eligible for listing in the Virginia Landmarks Register and the National Register of Historic Places. “Food deserts,” as defined by the U.S. Department of Agriculture (USDA), are neighborhoods and towns without ready access to fresh, healthy, affordable food (specifically fruits and vegetables). It is estimated more than 23 million Americans live in impacted areas. At least 17 percent of Virginia’s population is affected by limited food access or food deserts. On June 14, 2018, Virginia State University (VSU) is holding a fish cage-building workshop from 1:00 p.m. to 5:00 p.m. at Randolph Farm Pavilion, 4415 River Rd., Petersburg, Va. This workshop will appeal to anyone with a farm pond who is interested in raising fish in cages for profit or personal consumption. Participants will learn the basics of cage aquaculture and how to construct a fish cage. Cage-building materials will be provided, but participants should bring leather gloves, tin snips, a tape measure, cutting pliers and protective goggles. Dr. David Crosby, Dr. Brian Nerrie and Dr. Louis Landsman will make presentations at the workshop. The workshop is free and open to the public. Space is limited, so register early. To register, visit www.ext.vsu.edu/calendar, click on the event and then click on the registration link. If you need further information or are a person with a disability and desire any assistive devices, services or other accommodations to participate in this activity, please contact David Crosby at dcrosby@vsu.edu, (804) 712-3771. Please contact Mrs. Debra B. Jones at dbjones@vsu.edu, (804) 524-5496 during the business hours of 8 a.m. and 5 p.m. to discuss accommodations no later than five days prior to the event. Virginia State University has been awarded $249,800 by the United States Department of Agriculture’s National Institute of Food and Agriculture (USDA-NIFA) to expand its urban agriculture education through distance learning. 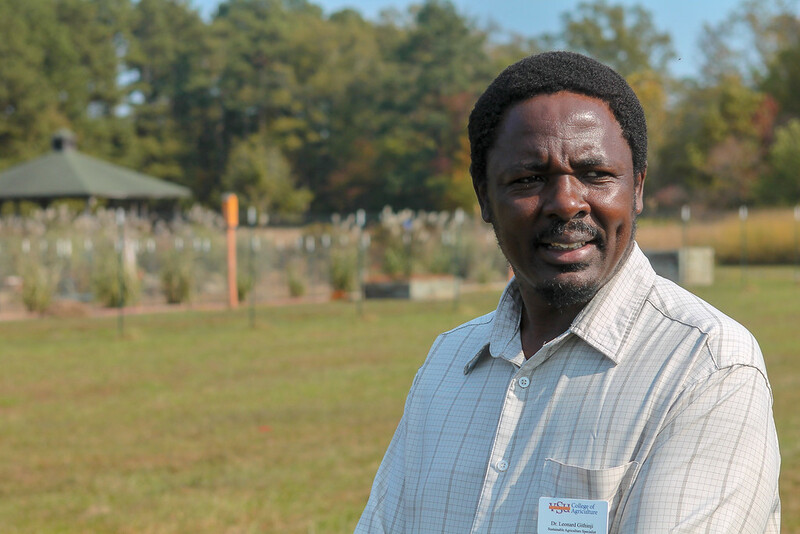 Githinji plans to adapt his Sustainable Urban Agriculture Certificate Program from its current face-to-face format to a self-paced, online option that will increase the number of participants. The grant money will help cover the costs of acquiring the technology to deliver the program and supporting the personnel needed to implement the distance learning modules. The online learning format will offer participants some flexibility to complete the course’s 16 modules according to their schedules. Upon completing the program, participants will receive a certificate in Sustainable Urban Agriculture. The program’s target audience includes Extension educators, Master Gardeners, teachers, home gardeners and commercial growers. At least 17 percent of Virginia’s population is affected by limited food access or food deserts. Urban agriculture, defined as the growing of plants and the raising of animals for food and other uses within and around cities and towns, has a huge potential in mitigating food deserts and situations of limited food access. Urban agriculture can help to remedy food desert situations, create economic opportunities in urban neighborhoods and help to nourish the health and social fabric of communities. Dignitaries show Tree Campus USA plaque updated with year 2017 for Virginia State University campus. Events were held during the morning, including the creation of a living wall of flowers and strawberries. There were also presentations on water quality, sustainable foodand goatscaping, an environmentally friendly alternative to property clearing and weed removal. By: M. Ray McKinnie, Dean/1890 administrator, College of Agriculture at Virginia State University. With the arrival of spring comes a perfect time to celebrate the industry and all the people working on the frontlines and behind the scenes. First thoughts may be the farmer on his tractor already at work at dawn, the sun rising over fallow fields, rows of freshly plowed soil. Virginia Agriculture Week is March 18-24, and Tuesday, March 20 is National Agriculture Day. I ask you to think about the people who are the heart and soul of American agriculture and those who support agricultural industries. For more than 100 years, Virginia State University’s (VSU) College of Agriculture has supported farmers and provided a rigorous curriculum for its students who have gone on to successful careers in agriculture. Our alumnae have made and continue to make notable contributions to the industry, and our current students the next generation of rising stars. Students with Ag degrees pursue careers in state and federal government agencies, in agribusiness, teaching and research, veterinary medicine, and traditional farming and ranching. Attendees at the VSU Agriculture Alumni Banquet Friday night where 62 NFA and NHA alumni were honored. While Owens wrote the constitution for the New Farmers of Virginia and helped lay the foundation for what would later become a national organization (NFA), Sargent lobbied within the Department of Education to officially create an organization in segregated schools. As the idea grew in popularity, chapters formed sporadically throughout the southern states and region. State associations emerged next and then sectional associations based on proximity. These sections held conferences and contests unifying the state associations until a national organization, NFA, was officially created in Tuskegee, Ala. on August 4, 1935. Its objective was to promote agriculture education, leadership, character, thrift, scholarship, cooperation, and citizenship among African-American youth, primarily in the southern states, where schools were segregated by law. As Virginia played a leadership role in the development of a national organization for African-American boys interested in agriculture, so did it for white boys with a similar interest. In 1925, Virginia Agricultural and Mechanical College and Polytechnic Institute (now Virginia Tech) organized the Future Farmers of Virginia for white boys in agriculture classes. This Virginia organization became the model for the national Future Farmers of America (FFA), founded in 1928 to bring together white students, teachers and agribusinesses to solidify support for agricultural education. Over several decades the NFA and NHA contributed extensively to organized instructional programs for African-American youth in public schools, who sought to develop their vocational skills, social lives, and pursue careers in agricultural education and home economics. Virginia-chapter members have held leadership positions at local, state and national levels, and have been recognized and received awards for their achievements. Both organizations are rooted in VSU’s rich history and have been instrumental in the development of modern day vocational education programs. The status of small-scale freshwater aquaculture in Virginia is the theme of the 30th Annual Aquaculture Field Day being held Oct. 19 beginning at 8:30 am at Randolph Farm, 4415 River Road, Ettrick. The Cooperative Extension Aquaculture Program at Virginia State University hosts this annual event. Dr. Brian Nerrie, assistant professor and aquaculture extension specialist, will give this year’s keynote address. His talk will focus on how the industry has diversified since 1988 from the initial emphasis on hybrid striped bass to recent expansion into freshwater shrimp in ponds and greenhouse aquaponics. This year’s field day will provide the opportunity for registrants to rotate between multiple stations featuring pond production of catfish, largemouth bass, bluegill and freshwater shrimp. In addition, pond cage culture and aeration systems will be presented. Indoor stations will include aquaponics, tilapia production, tilapia hatchery and a small aquaculture product taste testing. Virginia State University’s Aquaculture Program conducts important research in freshwater aquaculture, provides an important resource for limited-resource farmers and helps determine what consumers want. Through its research and outreach efforts, Virginia State University’s Aquaculture Program, as part of Virginia Cooperative Extension, is contributing to Virginia’s $91 billion agriculture and forestry industries. Registration is $20 per person and includes lunch. Farm-raised catfish will be served for lunch. To register visit www.ext.vsu.edu/calendar, click on the event and then click on the registration link. If you need further information or are a person with a disability and desire any assistive devices, services or other accommodations to participate in this activity, please contact Debra B. Jones at dbjones@vsu.edu or call (804) 524-5496 / (800) 828-1120 (TDD) during business hours of 8 am. and 5 p.m. to discuss accommodations no later than five days prior to the event. Industrial hemp, a crop with a long and storied history in Virginia, is the subject of an August 17 public field day at Virginia State University (VSU). This first-of-its kind event will provide a forum for potential producers, researchers, marketing experts and processing industry professionals to discuss the production and economic potential of this crop. The discussions will be useful to Virginia farmers who may decide to grow industrial hemp if legislation changes to make it legal again to do so. In 2015, Virginia lawmakers authorized the Virginia Department of Agriculture and Consumer Services (VDACS) to enter into a memorandum of understanding with universities within the commonwealth to grow industrial hemp for research purposes. As a result, Virginia State University, Virginia Tech and James Madison University are currently conducting industrial hemp research that will position the state to provide the necessary information farmers will need to successfully grow the crop should it once again be legalized. Meanwhile, the popularity of industrial hemp-made products soars. Currently all industrial hemp products sold in the U.S., including food, personal care products, clothing and even construction materials, are imported to the U.S. from Canada, China, Europe and other countries where the crop is legal. Industrial hemp (Cannnabis sativa L.) is botanically related to marijuana, but with very different properties. While marijuana is rich with tetrahydrocannabinol (THC), the psychoactive component that makes pot a drug of choice by many, hemp contains only the smallest traces of THC (<0.3%), making it virtually impossible to get high from. But it does produce strong fibers, and the seed has good quality oil that once made it a cash crop for America. Fiber-type varieties are used mainly for production of fiber that has multiple applications in the textile industry for yarns and fabrics, sail ropes and canvas. The remaining plant parts are used for industrial applications including paper, building material reinforcement, insulation material, bio-energy and more. Hemp seed is also valuable. It contains high quality oil currently used in the food, pharmaceutical, medical and cosmetic industries. The seed has a high protein content with a balanced amino acid profile and is used in human dietary supplements. Left-over cake material from oil extraction is a rich protein source used as an animal food supplement. In fact, hemp fiber was so important to our young nation that colonial farmers were often mandated to grow it. The Declaration of Independence is said to have been drafted on hemp paper, and our nation’s victory in the American Revolution can in many ways be attributed to the patriots’ use of hemp in making their ships’ sails, rope, riggings and more. George Washington grew it, and Thomas Jefferson bred improved hemp varieties. Abraham Lincoln also used hemp seed oil to fuel his household lamps. During World War II, the USDA developed a “Hemp for Victory” film to encourage everyone to grow the crop to support the war effort. The fibers were used for parachutes, rope, shoes, clothes and more. But during the mid part of the last century, strict legislation was passed that made it illegal to grow this versatile crop in the U.S., largely due to its relationship to its high-THC relative, marijuana. As a result, cultivars that once thrived across the country have been lost or remained unimproved, and no significant work has been done on production techniques and variety developments. Previous processing facilities collapsed and market availability that once drove production and supply has ceased to exist. He explained that it is a learning process to figure out each variety’s performance and potential problems, like weed and pest infestations. “Having such data will be important in developing production management guidelines for Virginia producers to facilitate high yields in the future, if and when industrial hemp becomes legal to grow again in the commonwealth,” Kering added. The Industrial Hemp Field Day is being hosted by the university’s Agricultural Research Station (ARS), part of the university’s College of Agriculture. The ARS is responsible for carrying out the land-grant university’s mission of conducting scientific agriculture and food production research that will increase profitability for Virginia’s small, part-time and limited-resource farmers. Land-grant initiatives such as these help support and grow Virginia’s $91 billion agriculture and forest industry. The event is free and open to the public. It will be held 8 a.m. to noon, Thursday, August 17, at VSU’s Randolph Farm, 4414 River Road, Petersburg, VA. Participants should register by visiting www.ext.vsu.edu/calendar, and clicking on the event. Dr. Berkita Bradford, who has been serving as the interim chairwoman of Virginia State University’s Hospitality Management Department, has been formally appointed to the position. The appointment is effective immediately. Bradford, who arrived at VSU in fall 2015 to serve as an associate professor and program coordinator, stepped into the interim chairman position January 2016 after Dr. Dianne Williams left the university for a position at Bethune Cookman University, in Daytona Beach, Fla. She managed the unit for more than 10 years. As chairwoman, Bradford will provide the department with administrative oversight and manage the day-to-day operations. "Dr. Bradford’s passion for the hospitality industry and wealth of experience in the field have positioned her to be an ideal fit to lead VSU’s Hospitality Management Department into the future,” said Dr. M. Ray McKinnie, dean of VSU’s College of Agriculture, which houses the Hospitality Management Department. VSU's hospitality management program is one of only five Historically Black College and University (HBCU) programs accredited by the Accreditation Commission for Programs in Hospitality Administration (ACPHA), which proves the program exceeds standards in educational quality. The objective of the program is to provide students leadership and managerial training with real world hospitality educational experiences. The curriculum is designed to develop students’ focus on operations management at the property level and prepare them for management careers in the hotel and restaurant industry, food and beverage industry, convention and event planning, as well as at resorts, casinos and more. Recent VSU hospitality management graduates have been hired by top national and international companies, including: Hyatt Hotels and Resorts, Marriott International, Inc., Thompson Hospitality®, Sodexo, Aramark, U.S. Omni, Hilton, Four Seasons, Outback, Darden, and Loews® Hotels & Resorts, among many others. Applicants are required to pay a $190 one-time fee that will cover registration, instructional materials and lunch. Registration and a limited number of full and partial scholarships are available on a first-come, first-served basis. Registration is limited and closes March 3. To apply for a scholarship or to register, visit www.ext.vsu.edu/urban-agriculture-certificate-program. As part of an eastern U.S. tour agenda, a three-member Armenian delegation will visit Virginia State University’s aquaculture facilities on Sept. 15 to learn about best management practices used to help limited-resource fish farmers utilize water resources more efficiently. Armenia is a nation and former Soviet republic located in Western Asia. Under the auspices of a PEER (Partnerships for Enhanced Engagement in Research) grant supported by USAID (United States Agency for International Development), project staffers are working with approximately 20 small fish producers growing trout and sturgeon in Armenia’s Ararat Valley. Fish farmers there are using inefficient water technologies and experiencing a depletion of artesian water resources. Project objectives include developing an educational outreach program and fostering sustainable fisheries that use water resources more efficiently. Dr. Brian Nerrie, VSU aquaculture extension specialist who will direct the tour, cites distinct similarities between VSU and Armenian aquatic programming efforts and considers fish farmers concerns to be universal. Nerrie said VSU has worked with more than 300 fish farmers across the state who grow hybrid striped bass, catfish, trout, tilapia and freshwater shrimp. The Armenians realize they’re wasting water and experiencing water quality issues, so they seek enlightenment on successful strategies we’ve implemented to address many of the same concerns, said Nerrie. We’ll not only share our accomplishments with them, but demonstrate how they might apply some of the same strategies to address their current dilemma. For more information on the Armenian visit or VSU’s Aquaculture Program, contact Nerrie at (804) 534-5903 or email bnerrie@vsu.edu.